(autoinsidernews) - Following the leak of photos the 2007 Ford Mondeo sedan, the automaker has decided to offically release some photography of the car. The car pictured is a hand-built, one-off car that was built for the upcoming James Bond film Casino Royale,' which will be released in November. The hand-built Mondeo was assembled specifically for the movie at Ford of Europe's Design Studio in Cologne, Germany in January, reports Trend. 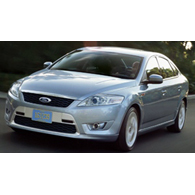 The new Mondeo was essentially still on the drawing board when we were asked to supply the vehicle for filming in February 2006, said Martin Smith, Ford of Europe's Executive Director for Design. As volume production for the car doesn't start until the second quarter of 2007, we had to create a one-off, driveable model based around a design studio property! The Mondeo shown in the images and in the film is representative of the new Mondeo with a sports bodykit. We wanted the property to be fully representative of a top-of-the-range new Mondeo, Smith added. The end result is so convincing that you would never know its origins, and we even added a unique body kit to the vehicle to emphasise its sporty and dynamic design.